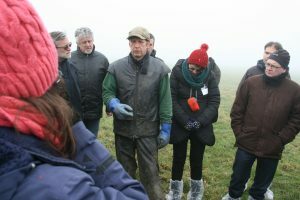 Last month (January 2017) the network of EuroDairy visited some farms to get a better notion of innovative farming in England, one of them was Woodland Farm of Robert Richmond. Woodland Farm is a typical low cost farm covering 200 ha with 300 spring calving Friesian and Dairy Shorthorn cattle yielding 5000 l milk per year with 70% of the milk produced on grass. Concentrate consumption is 800 kg per cow per year. It is an organic farm since 2007 and antibiotic free. The farm is on dryland on top of the Cottswolds, with a swallow top soil on lime, trying to improve the organic matter content of the soil by spreading 20 tonnes of compost per ha per year. The grass sward has a great diversity of species. All cattle are grazed whole year round. It is a spring calving herd, which means that all cows are dry from mid-December till mid-February, grazing onto kale (or leaf cabbage - Brassica oleracea) until calving. The advantage of the diverse swards is the more even distributed production over the season. By reseeding the seed mixture contains - next to a diversity of grass species - also legumes and herbs, mainly ribwort plantain (Plantago lanceolate) and common chicory (Cichorium intybus). Herbal lays are grazed in a more mature stage, cows are going onto swards when they are 30-50 cm high, grazing them down to 3-4 cm. the farm is self-sufficient for forage.